Osmosis: Neurofibromatosis. (2019, April 24). Retrieved from (https://www.osmosis.org/learn/Neurofibromatosis). Neurofibromatosis type I is a tumor disorder that is caused by the mutation of a gene on chromosome 17 that is responsible for control of cell division. Neurofibromatosis type I causes tumors along the nervous system and can grow anywhere on the body. 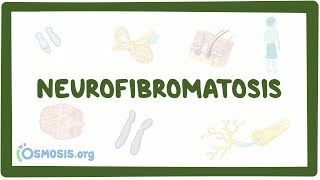 Neurofibromatosis refers to several genetically inherited conditions that are clinically and genetically different and carry a high possibility of tumor formation. This disorder is divided into neurofibromatosis type 1, neurofibromatosis type 2 and schwannomatosis. Neurofibromatosis is an autosomal dominant disorder. Neurofibromatosis type I, in which the nerve tissue grows tumors (neurofibromas) that may be benign and may cause serious damage by compressing nerves and other tissues. Neurofibromatosis type II, in which bilateral acoustic neuromas (tumors of the vestibulocochlear nerve or cranial nerve 8 (CN VIII) also known as schwannoma) develop, often leading to hearing loss. Schwannomatosis, in which painful schwannomas develop on spinal and peripheral nerves. Neurofibromatosis type 2 is a disorder characterized by the growth of noncancerous tumors in the nervous system. The most common tumors associated with neurofibromatosis type 2 are vestibular schwannomas or acoustic neuromas. is the gene involved in inherited neurofibromatosis types I. A 16-year-old boy comes to the clinic because of the appearance of several "lumps" all over his body for the past year. He states that they have progressively appeared and growth, are not painful, and none have gone away. Family history is significant for the development of similar symptoms in his father and uncle while in their teens. His temperature is 37.0°C (98.6°F), pulse is 72/min, respirations are 18/min, and blood pressure is 126/73 mm Hg. Physical examination shows numerous small cutaneous tumors all over his body and pigmented hamartomas on each iris. He also has hyperpigmented macules of varying sizes on his back and axillary areas. Which of the following is the most likely diagnosis of the cutaneous lesions?